If you have a HoloLens, you can now control the lighting throughout your home or office via holographic controls using the free Hue Lights app in the Windows Store. The app, made by California-based AfterNow, works with the Philips Hue colored lighting system and is much more polished than the prototype we saw in January. As we've mentioned many times before here on Next Reality, the open and currently unsolved problems associated with mixed and augmented reality leaves a good deal of room to experiment and find new solutions — with very few preconceived notions about how to do it correctly. User experience (UX) design is the center of these experiments, and finding effective and natural solutions is typically the approach UX designers aim for. Though there can be other elements to aim for as well, immersive, interactive, and fun are all approaches that come to mind. A quick Next Reality demo showing the Hue Lights app in action. Internet of Things, more commonly know as IoT, is becoming more prevalent in our world, and smart homes and offices will be the norm in the not-so-distant future. For efficient solutions to IoT right now, smartphones are the go-to controllers, which do a pretty good job of handling a few devices around the house or office. Wherever you are, just pull out your phone and tap a few buttons — situation handled. But what if your needs involved handling an entire building with hundreds of IoT devices? With the growth of the IoT in recent years, this possibility is real and coming soon. The tiny screen of a smartphone will likely struggle to handle that much information at one time, and with that, we're back to the drawing board. Can you tell me a bit about AfterNow? We're a 13-person team of developers, UX/UI specialists, designers, and marketers founded by Philippe Lewicki. We spend our days working on client projects, researching emerging technologies, and hosting talks and meetups within the community. Our lab, located in the main office, looks like something Doc Brown would spend his days in, with every gadget imaginable strewn about. We are located in Culver City, on the outskirts of Los Angeles, with a satellite office in Bangalore, India. Would you say that AfterNow is a technology company? In some ways, it appears that you come from a very creative approach. Don't let that statement imply that you cannot be a creative technology company. The heart of that question is how do you see yourselves? I see us as a collection of creatives and dreamers, trapped in a technology-centric body. One of the things that excites us most is the very real sense that creativity is going to be a key attribute in creating industry-changing paradigms for MR. We believe our team composition and processes put us in a good place to leverage our creativity and succeed in this space. 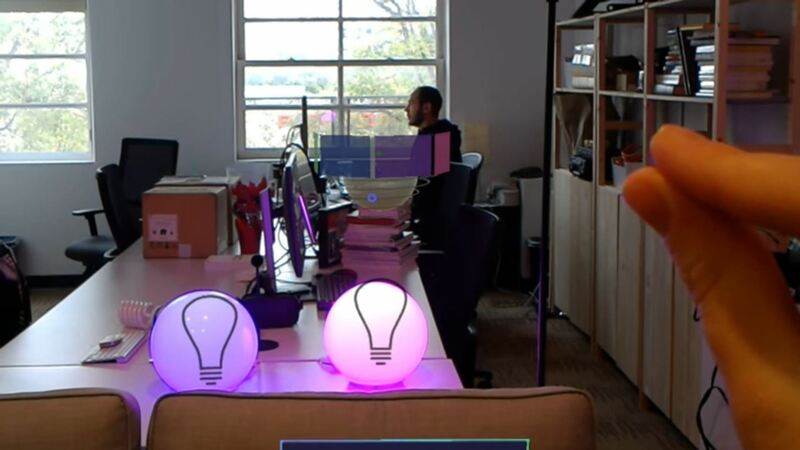 Anthony Corrado and Philippe Lewicki of AfterNow talk about Hue Lights. If you could paint what success looked like for the company, what would it look like? It would mean seeing our work and research being used in many different verticals within the MR industry. We've worked on very diverse projects over the years, and we would love to continue this in the new landscape. Specifically, seeing our holographic interfaces at the core of projects ranging from entertainment to collaboration tools to product sales platforms. Success would also come in the form of helping to build a thriving MR community. We are fortunate to have met some amazing people and teams through meetups, events, and outreach. The connections have been mutually beneficial and we want to see our friends and partners succeed, too. How early did AfterNow get a HoloLens? We started working with the device in April . In June, Microsoft reached out and invited us to participate in their HoloLens Agency Readiness program. In July, we began the program. Unity using C#, Visual Studio, an Asus gaming laptop, and a HoloLens on my head half the day. Philippe, the founder of AfterNow, remotes into his laptop via the HoloLens and codes on various holographic windows. I have yet to make that level of bionic transformation. Did you find it difficult to get the communication between devices functioning? Philips has a very developer-friendly API with the Hue, and it proved to be pretty straightforward to get the devices to play nice. One notable challenge was building and parsing these payloads in Unity and C#, as the API uses JSON requests and responses. Do you have a particular interest in the mixture of IoT and mixed reality? As a child, I was in love with Disney World and the way each experience could transport you to a completely different place. I thought being an Imagineer was the coolest job you could have. Now, when used creatively, IoT devices give you that same power to shape mood and atmosphere. Enter mixed reality and you have the ability to wrap your local surroundings in an immersive storyline or narrative. Real lights change to match the virtual back-alley jazz club. A Wi-Fi-connected fan kicks in to simulate the breeze as you step outside of the club. The smartwatch on your wrist vibrates to alert you of an in-game clue — which you respond to by making a virtual call from your MR headset. I don't usually build things for the entertainment industry, but when it comes to IoT and MR, I really love the potential! With so many problems to solve in the mixed reality world, what made you choose this as the premier AfterNow HoloLens project? First, a universal challenge in MR is creating interfaces that are freed from a slab or 2D screen and free of physical constraints. What would an interface that is optimized to use depth, perspective, rotation, etc. look like? Hue Lights provides us with a base platform for testing interactions with 3D models as controllers. We have been able to get many people in the experience, take detailed notes, and get valuable feedback on their behaviors. Second, we believe strongly that MR is on its way to becoming a part of everyday life for nearly everybody. We felt that making something that would allow users to alter their real world from within the HoloLens would be a great introduction to this concept. Thanks to Anthony for allowing me to interrupt his workday a few months ago and answer my questions. I could not agree more with his and the rest of his team's assessment. If you get a chance to use Hue Lights (you can download it here), you will not only see a fun and immersive UX design, but you will see a real decisive use-case — a highly astute microcosm — of what managing an office building, shopping mall, or apartment complex could look like in the near future. While Hue Lights may not be an efficient or effective solution for the three light bulbs I have for my home at the moment, when that number grows to 15, the efficiency ratio increases exponentially. And you know what? It has immersive, interactive, and fun covered. If you want to see what Anthony is doing now, head to his profile here on Next Reality and check out all of his how-to guides for developing for the Hololens.